Rent to own Apple - MacBook Pro - 13 inch Display - Intel Core i5 - 8 GB Memory - 128GB Flash Storage (Latest Model) - Silver. No credit needed. Bad credit okay. The silver mid 2017 Apple 13.3" MacBook Pro is faster and more powerful, yet thin at 0.59" and lightweight at just 3 lb. This system is powered by a 7th Gen Kaby Lake 2.3 GHz Intel Core i5 dual-core processor that features a burst speed of up to 3.6 GHz, while 8GB of 1866 MHz LPDDR3 RAM helps to ensure smooth multitasking and also allows the computer to quickly access frequently-used files and programs. 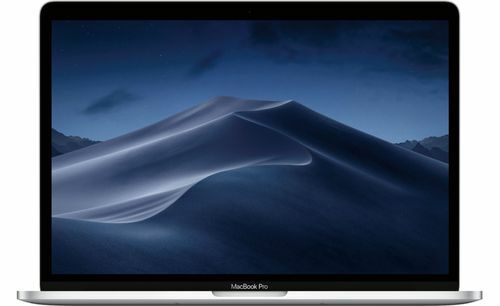 For long-term storage of your files, this MacBook Pro is equipped with a 128GB PCIe SSD, with sequential read speeds up to 3.1 GB/s and sequential write speeds up to 2.1 GB/s. If you want to add external peripherals, dual Thunderbolt 3 ports support bi-directional transfer speeds of up to 40 Gb/s, while also supporting 10 Gb/s USB 3.1 and device charging. 802.11ac dual-band Wi-Fi is built-in for wireless networking, and Bluetooth 4.2 technology will also allow you to connect additional compatible peripherals. Other integrated features include a 720p webcam, dual microphones, stereo speakers, a 78-key backlit keyboard with 12 function keys and four arrow keys, an ambient light sensor, and a larger Force Touch trackpad. The embedded 128GB PCIe SSD provides sequential read speeds up to 3.2 GB/s and sequential write speeds up to 2.2 GB/s.